New Art! New Pages! New Characters! I’ve gone back over all the pages in the first story so I could clean it up a bit — mostly visual continuity. Lemme show you what I mean. If you’ve read the comic, you’re probably familiar with these two panels from the very first page. You’ve seen them dozens of times, right? Well…sort of. 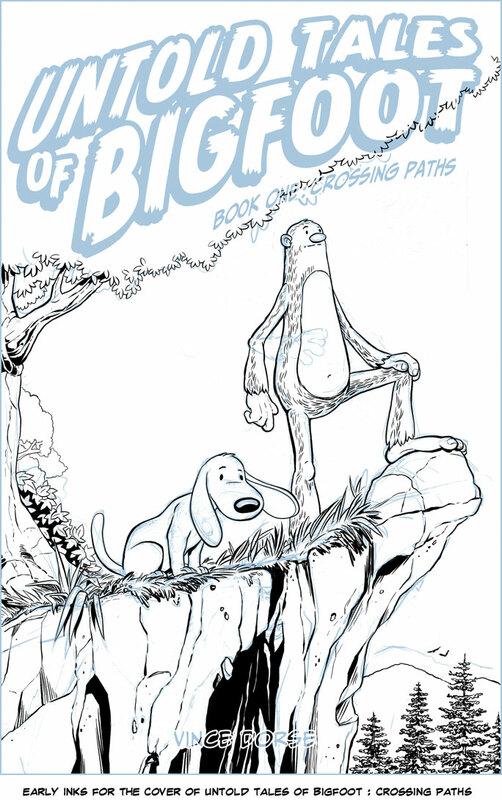 The fact is, when those panels first went live, I’d just started drawing Bigfoot. So his design hadn’t yet coalesced into the friendly cryptid you know and love. In fact, when they first went up, those two panels looked like this: Yikes! No wonder he didn’t have any friends! Anyway, I’ve spent some time going over those old pages and making Bigfoot look like Bigfoot. Same with Scout and the rest of the gang. But that’s not all I’ve been doing. I also added about 10 pages (!) to the book. Stuff that helps flesh out the story a bit and tie up some loose ends. Some of your old favorites (a certain squirrel I could mention) get a little more page-time now. And I even managed to find a spot for a new character. 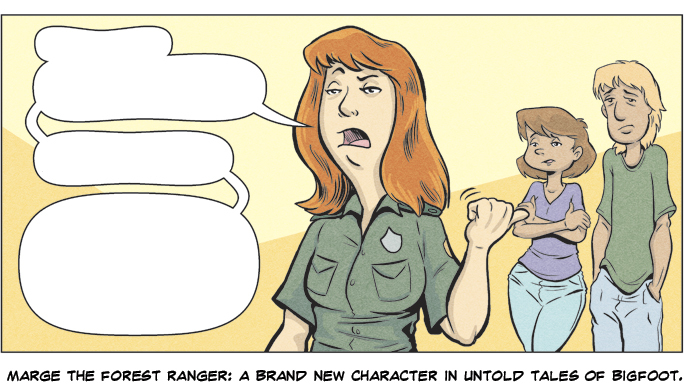 Margie, another Forest Ranger, plays a small, fun role in this story, and since I have plans for her in Book Two I thought this would be the perfect way to introduce her. 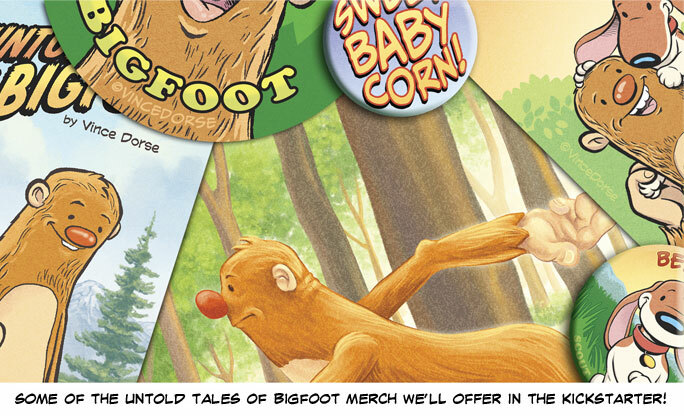 The main goal of the Kickstarter will be getting the book into print, but I’ll also be offering some fun Untold Tales of Bigfoot Merchandise that you can’t get anywhere else! We’re gonna have bookmarks, stickers, buttons, prints and other UTOB stuff that backers will get if we hit our goals. There’s even a plan to put backers right in the woods with Bigfoot and Scout, as well as some other ideas for stretch goals we’re tossing around. You’ll have to wait for the Kickstarter to launch before I give you those details — I’m shooting for Tuesday, May 24th and there will be some early-bird specials for a few lucky people who jump right in. I’ll post again on the day it goes live so you can be among the first supporters. Until then, please mention the upcoming UTOB Kickstarter to anyone who might be interested. Like I said, we’ll need all the support we can get. And to tide you over, here’s a sneak peek of the cover art I’m working on. Pretty excited about this Vince! Best of luck and you have at least one guy who is going to plug the heck out of this! I’m excited! Love your Bigfoot and I do want a book! 🙂 this is good news. Exciting that you’ve come this far, Vince! I remember when we were just nagging you!